The feds charged 18 former and current Los Angeles County Sheriff’s deputies for corruption and civil rights violations stemming from inmate abuses. 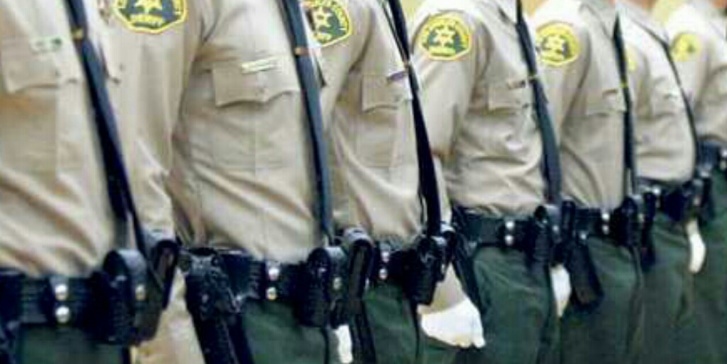 Los Angeles, CA – On Monday, André Birotte Jr., U.S. Attorney for the Central District of California announced that 18 former and current Los Angeles County Sheriff’s (LASD) deputies were indicted for alleged corruption, and abusing inmates and visitors. 16 of the deputies were taken into custody on Monday at Los Angeles County Sheriff’s facilities and the rest voluntarily surrendered to the FBI. All of the deputies indicted in five separate cases appeared in a federal court on Monday to face charges of corruption, obstruction, making false arrests and abusing inmates and visitors. Birotte described, that deputies were allowed to beat and humiliate inmates, including visitors. A two year investigation involved five cases that revealed Sheriff Lee Baca did nothing to prevent such abuses and corruption within the department after a commission criticized him for a lack of oversight and allowing deputies to act like if they were about the law. Baca denied the allegations, but the FBI probe found that deputies thought they were above the law and continued to abuse inmates. Two Lieutenants, Gregory Thompson and Stephen Leavins are accused of hiding an FBI informant and changing department records by housing the inmate in another section of the downtown jail. The inmate was testifying against deputies involve in abuses of inmates. Several Sergeants, Scott Graig and Maricella Long are accused of trying to intimidate an FBI agent into providing information about the probe against the rest of the deputies and supervisors. Each of the four deputies – Sussie Ayala, Fernando Luviano, Pantamitr Zunggeemoge and Noel Womack – are charged with participating in at least one of the four incidents in which victims allegedly suffered civil rights violations. In one incident, a man suffered a broken arm and a dislocated shoulder that has left him permanently disabled. In another incident, the Austrian consul general and her husband were handcuffed and detained. The fifth case unsealed on Monday is a criminal complaint that charges three LASD deputies, all of whom are brothers, with conspiracy to make false statements to two banks in connection with a “buy-and-bail” mortgage fraud scheme. The complaint alleges that the three deputies – Billy Khounthavong, Benny Khounthavong, and Johnny Khounthavong – made false statements and reports to Flagstar Bank to purchase a 3,900-square-foot residence in Corona. The brothers then made additional false statements and reports to Bank of America in relation to another large residence they owned. The brothers walked away from – or “bailed” on – that home in which they were “under water,” meaning they owed substantially more than the residence was worth. As a result of the scheme, the brothers allegedly avoided more than $340,000 of unpaid mortgage debt. Benny Khounthavong and Johnny Khounthavong are assigned to LASD jail facilities. The five cases announced on Monday are part of an ongoing investigation being conducted by the Federal Bureau of Investigation, according to Birotte.